The ISA is pleased to announce that Wanning, China will host the 2018 ISA World Longboard Surfing Championship on Hainan Island from January 19-25. The world’s best National Longboarding Teams will gather at the famed left point of Riyue Bay to represent their nations and go for Gold in this classic ISA discipline. The ISA World Longboard Surfing Championship, traditionally held as a discipline in the ISA World Surfing Games, was first held as a stand-alone event in 2013 in Huanchaco, Peru. Team France made history and earned the honors of the first World Team Champion in the event, while France’s Antoine Delpero (Open Men), South Africa’s Simone Robb (Open Women), and Hawaii’s Honolua Blomfield earned the individual Gold Medals. The ISA has a rich history of hosting events in China as part of a strategy to expand the sport of Surfing to new markets around the globe. The ISA first engaged China in 2010 which lead to the hosting in 2012 of the Hainan Riyue Bay International Surfing Festival, featuring the ISA China Cup. Held until 2014, the competition resulted in great strides forward for the growth and development of Surfing in the region. Riyue Bay, a relatively unknown Surfing destination at the time, burst into the international spotlight when surfing competitions were brought to the region with collaboration between the ISA and the World Surf League (WSL) – formerly ASP – which saw the sport widely practiced in the region, turning it into a destination for visiting surfers. 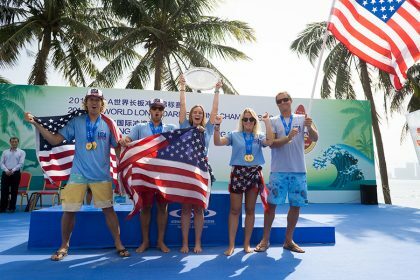 As proof of the legacy left in China by ISA World Championships, that nation recently fielded their first team to ever compete in the ISA World Surfing Games, headed by former ASP World Champion, Peter ‘PT’ Townend. The event proved to be a great learning experience for their blossoming surfers and a key step in their ultimate goal of qualifying athletes for the Tokyo 2020 Olympics. For news and updates surrounding the event, stay tuned to www.isasurf.org.